Manehattan Update #43: Introducing Ebon Quill + Recruitment Time! Novel Idea here with your regular Thursday update. Because it’s awesome. And you know you love it. Now technically, I have some new art I could show you. But instead, I want to keep that under our hats a bit longer. Don’t worry, there’s a very good reason for it. And I promise you’ll like it. A lot. But now, we’ve got a member who just joined this morning. Actually, he accepted the position while I was writing this post! Serendipity, anyone? I’m happy to introduce Ebon Quill, who will be joining The Manehattan Project as a Worldbuilding Writer! Worldbuilding Writers are a critical part of our storytelling team. While I may have written all the story script and dialogue, I simply can’t write everything. These brave souls fill that enormous gap. They will be writing the terminal entries, notes and scraps that breathe life into the backstory and world of Gardens of Equestria. Ebon Quill: A humble luminist who has stumbled into working on a project that blends two of his favorite things. He is working on terminal entries, and will provide nothing less than his best. He has been writing non-professionally for years, and has been involved in all manner of geekdom forever. He’s always available to talk, so drop him a line! I realized it’s been a while since we’ve done a recruitment post! While we have an utterly amazing team of artists, modelers, writers and scripters, we’re always on the lookout for more talent. So I want to highlight a few of the positions where we could use some help! Artists: We’re always looking for more artists. 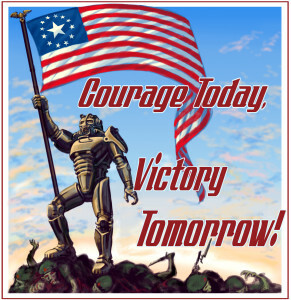 It’s my hope to create posters for every single poster or image that Kkat described in Fallout: Equestria and a whole lot more, not only for GoE 1 for Fallout: New Vegas, but for GoE 2 for Fallout 4 as well! Art is the one thing where we simply can’t have enough! Scripters: Scripts are the lifeblood of any game and GoE is no different. Every quest, every encounter and even every conversation is controlled by scripts. We’ve got some amazing talent in the scripting department, but we could always use some more help here. If you have any programming experience and have some familiarity with the GECK, we’d love to have you. PR Director: Yeah, I know. I’ve been asking for this for about a year or so. I know it’s a pipe dream, but if you want some experience doing public relations (such as this post!) for Manehattan, please let us know! New Position – Web Director: We’ve got some concepts for a major overhaul for the GoE site, but I simply don’t have the time to do it on my own. If you have experience with CSS, HTML and other elements of website design, please contact us for further details. If you’re interested in any of these roles or think you might be able to contribute in another way, please head over to our newly-revamped Development Team Recruitment Center! That’s all for this week folks. Have fun and stay safe out there! Don’t worry, I won’t talk your ear off here. I already did that in the other posts. I just wanted to make sure you all had a single place to find all of our One Year Anniversary material! First of all, let’s get things fired up with the new Gardens of Equestria Main Theme. I am SO VERY THRILLED with this. This is partially inspired by the introduction themes to Fallout 3 and Fallout 4, while spanning the entire music range of GoE itself. Corvus completely outdid himself. I totally freaked out when I heard the thunder bit in there and was going SQUEE SQUEE SQUEE for like ten minutes. But he also did something utterly amazing. At the very end, you might notice a familiar little tune. That is indeed the Fallout theme! While we’ll likely be tweaking it a bit here and there, this is what you’ll be hearing when you fire up GoE: This Coming Storm for the first time…or any time you fire up FO:NV with GoE loaded! Next up, we have our debut of our amazing new Cinematics Lead, Scarlet Moon. With a ton of After Effects experience (and a ton of other experience that I can’t even begin to list), I am very happy to have someone with her talent on the team. It means I don’t have to do all the cinematics anymore! Yay! Someone who knows what they’re doing! Finally, we have one more music trailer that we released early this morning. The Primm Basement sketch! That wraps up our YouTube material for this week. But wait! There’s more! If you happened to miss last week, we released the Topaz Lake Score video and more importantly, Smuggler’s Run 2.0! That’s right, new artwork, new file structure (it’s a big deal, really) and a radio station with the Smuggler’s Run Theme! We’ve also completely updated the “Sounds of the Wasteland” page with all of our new music trailers! I’ve also written up a One Year Anniversary Retrospective about the Manehattan Project Team, what started this whole thing and some of the wisdom I’ve gathered along the way. Not only that, but we’ve announced the launch of The Manehattan Network, a new home for all things MLP Modding. Please remember that this is in the very early stages of development and may or may not pan out. It’ll depend entirely on you! We’ve even got more material on the way in celebration, but it’s not quite ready yet. Don’t worry, soon ™! We’ve also got three new members of the team! How to even start? Scarlet Moon is an riddle wrapped in an enigma stuffed in a chimicherrychanga. Professionally, she is a special effects and motion designer, but mostly a huge geek and a super nerd. 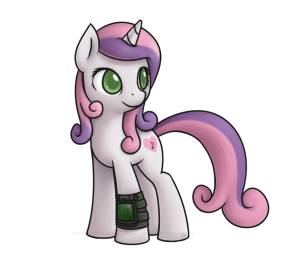 She has been a MLP and video games fanatic since a young child. After losing touch with MLP for several years, through the magic of friendship, she rekindled her love of everypony and met Novel Idea, who encouraged her to use her powers of movie magic for the good of Fallout: Equestria. In her free time, she enjoys cooking, reading, drawing, painting, watching movies, making movies, playing games, and chilling with her cats. Her ideal time is building something with her hands, whether it’s a cake or a replica of Hobbiton. 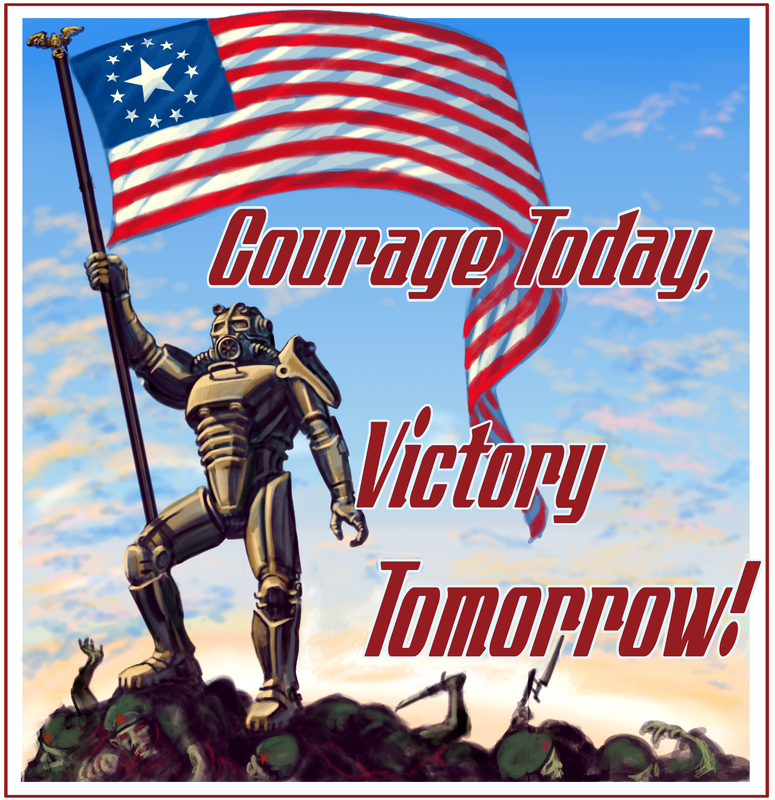 I’ve been modding Fallout: New Vegas for 2 years now, and have published two mods on Nexus. I applied for Script Engineer position after stumbling upon one of Novel Idea’s blogs. Finland FTW. Hi there! I’m Sunshine. I enjoy playing games, though I don’t get new games to play very often. I also write stories about ponies, participate in a pony-themed roleplaying group, and occasionally make pictures of ponies in Source Filmmaker. Funnily enough, I first discovered the Fallout series from Fallout: Equestria. And when I did, it was love at first sight. And now I’m a QA tester for GoE, putting my love of Fallout and Fo:E to a more practical use. I’m looking forward to doing my part for the Manehatten Project. That’s it for this week folks. I’m totally exhausted. This took a heck of a lot out of me. So until next week, have fun out there! Manehattan Update #35: Want to Play GoE? Novel here with something a little different for you. A few of you have asked when you’ll get to see GoE and I know everyone’s wondering. Well, guess what? We’re looking for folks to help us test the game! Now, before we go any further, let me tell you a secret. All those commercials about how testing video games is playing video games all day? (Especially the one where the stunning woman walks in with drinks for two guys on a couch. *Facehoof*) Those ones from Westwood, DeVry or Full Sail or other groups? They’re all flat out lying. Game testing is a very detailed and methodical trade. It requires attention to detail, consistency and excellent communication skills. We’re looking for folks with that mentality. People who might be interested in going into professional video game QA at some point. This is a great way to get some real experience in the field. We happen to have some folks on the team with professional QA experience, so we’re happy to help start you on the right path. There’s a bit more to it, but we’ve left that on the new QA Recruitment Page. How we’re starting everyone off is by doing some QA on our already-existing mod, Smuggler’s Run. While you may have already downloaded and played it, there’s going to be a special QA version that we’ll release specifically to those who are interested in joining this subteam. It’ll be ready by tomorrow. After the Smuggler’s Run “test,” we’ll move you into the position as a full member of the QA Team. At this phase, we’re doing environment exploration testing. All those cool spots you got to see in the Environmental Preview trailers? We want you to check them out. Go over them with a fine tooth comb. Are they cool? Did you like them? Did you get lost? Was it too easy? Did you find any blasted floating trees (floating trees are the bane of my existence…me and anyone else who’s ever done a worldspace)? So if you’re interested in helping us out, let us know! Finally, don’t forget that we’re on the home stretch for the Fallout: Equestria (Manehattan Edition) audiobook YouTube release! In just a few days, we’ll have the entire book up on YouTube! Celebrations! Joy! Delight! Squee! So if you’ve never read or listened to Fallout: Equestria (and if you’re reading this, seriously, what’s your excuse? ), now’s the perfect time! You’ll find the current playlist below. That’s it for this week folks. We look forward to chatting with all of you who are interested in helping test out GoE and making it 20% Cooler! (Oh shut up. It had to be done). The Manehattan Project Update #26: Welcome to 2016! We here at the Manehattan Project hope that the holidays treated you well. As for us, ironically half of us were sick during most of them and the other half spent a bit more time in Fallout 4 when we should have been working in GoE. Such is the way of gamers. But don’t worry, we’re almost completely back on track. We’ve made some internal changes to the way we’re handling the workload that should bring things to fruition much sooner. At the moment, I’m happy to say that we even have a general goal for launch. While we’re not ready to share that just yet, know that this is coming. Soon, the Manehattan Project will invite you to head back to New Pegasus and save two worlds. It’s in that vein that I’m here today. We have a couple important openings I’m sure you will be interested in. Retextures: We’re looking for folks who are adept at changing existing in-game elements to fit the FO:E asthetic. For example, you would change the primary image file for the signs says “Overseer” to “Overmare.” There are a lot of little changes that need to be made and we need someone to make this happen. We’re also looking for people to create higher-resolution versions of the existing material (such as foodstuffs and drinks). 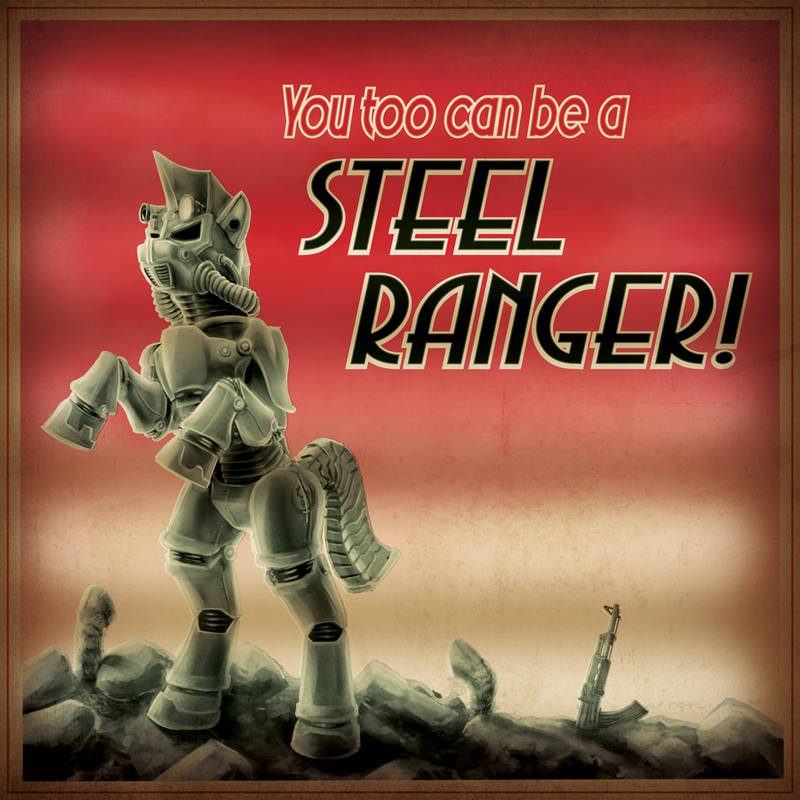 Original Artwork: We’re also looking for individuals to create original artwork for the various skill books, magazines, Ministry posters and other Fallout: Equestria-style material. We need them to be high-resolution (at least at Fallout 4’s level) so we can reuse them for GoE 2. There’s a lot of freedom in this role, but we do have a few critical projects. You’ll be working hand-in-hand with our Lead Artist, Littlepip/FancyCat. In addition, if you already have some art like this (or know of people with art like this), please let us know in the comments! PMV/Visualizer/YouTube Effects Artist (After Effects): This is a completely new position we’re just announcing today! We’re looking for someone with some minor experience in After Effects. We have several big trailer projects (including a totally epic Launch Trailer for GoE 1) along with our music announcements. Heck, if you want to even add some cool effects to the audiobook videos, that would be great! All you need to have is After Effects and a willingness to make epic things. Those are the two big roles we have open at the moment. If you’re interested, please drop us an application! Thanks to Reddit, we have our new Calamity tentatively cast already. Polyphonic is over the moon about this potential candidate. In addition, massive work has been done on the Rock Farm Sector 3. That’s all we have for this week. But now that the holidays are over, the kid gloves are coming off. We’re making this happen. We’re going to give you an awesome reason to head back to New Pegasus…and make you wonder just what we have in store for you in GoE 2 in Buckston. A very happy Hearth’s Warming to all! Novel Idea here (you know, like every other time). I won’t keep you long today. I just wanted to let you know that we won’t be doing updates for the next two weeks. You know, Christmas/Holiday/Hearth’s Warming, etc. However, it doesn’t mean that we won’t be busy! I will be doing a lot of backend work to set up for some efficiency and reporting improvements on our internal systems. As I haven’t received a response from the admins of the Nexus (and I strongly suspect I know the answer), I’m also going to be preparing our internal forums for the potential launch of “The Manehattan Network,” a central hub for all MLP and Fo:E mods for Fallout 3, Fallout: New Vegas, Skyrim and Fallout 4. (And maybe other games too!). I have no intention of hosting any mod directly on this site, but I intend this to become a database where everyone can find and discuss our favorite mods. Hopefully, some great collaborations can come from this. However, if this is going to work, I’ll need your help. You’ll need to spread the word and let everyone know about it so they can join up. After all, we’re stronger together! I also intend to get some bug fixes into Smuggler’s Run in the next two weeks, so you’ll have a fun new version to play with in 2016. And don’t worry, we plan on doing preview mod for Fallout 4, though details on that are completely under wraps (deep inside my head…it’s a scary place, so don’t try and get them out). Remember, we’re still looking for folks willing to help out! We’ve opened up all positions, but you need to have samples and experience. We’re essentially creating a full-fledged DLC here for both New Vegas and Fallout 4, so bring your A game! We’ve had a communications snafu with the audiobook, so I’m sorry to say we’re still on hold for that. But as soon as I get the new version, I plan on updating all of the YouTube videos. We’re also looking for anyone who has experience in creating visualizer effects for YouTube videos (specifically for our music videos, not the audiobook. 😉 ). If you’re interested, let us know! Have a great Hearth’s Warming and we’ll see you in 2016! The Manehattan Project Update #23: NaNoWriMo Victory + Beta Keys! This is my seventh consecutive win for National Novel Writing Month on a personal level and it has been well worth it. Why? Because I now know the opening of Gardens of Equestria II: Racing Apotheosis for Fallout 4. It came to me while I was writing a short little commentary on the story. I now have a much better idea of what we’re going to do in GoE II (yes, I’m “rebranding it.”). And it’s going to be awesome. Seriously awesome. Here’s something else awesome: The Manehattan Project has decided to offer up three beta keys for the 50K Winners of National Pony Writing Month, hosted by Equestria Daily. I’ve also decided on behalf of the Manehattan Project to toss in a Starcraft II: Legacy of the Void Collector’s Edition Digital Key for anyone who passes the 50K mark. (I’ve decided to decline any potential rewards myself). Now before you start clamoring for beta keys of your own, please note that these beta keys will only become active when “This Coming Storm” is ready for its beta. That’s likely not going to be for at least a few weeks minimum. We may be doing limited distribution of a few more later, but we’ll cross that bridge when we come to it. The beta includes a full NDA (Non-Disclosure Agreement) similar to what Overmare does with their work. After all, we don’t want to spoil the surprise, do we? As for development, this week will likely be slow for us for obvious reasons. That being said, I’m happy to say that both Trench and Wolf are back up and running after a nasty issue that was causing the GECK program to crash every time our central mod was loaded. (Took six hours to nail down that one. I had to copy my own Data folder to finally get that resolved). As for me, I’m thrilled that the full level decor is now complete for the Rock Farm Sector 2: Administration, an immense sprawling office complex where you’ll be hunting for your friends after separated by the Rock Farm’s erratic security systems. I’ve also started lighting and decor on the biggest level I’ve ever designed: Sector 3, the heart of the Rock Farm’s R&D. It’s here where players will discover some of the most powerful weaponry ever conceived by the MAS and MWT along with unique armor and race to stop the brutal death of every living soul in Appleloosa Valley. It’ll be awesome. Finally, on a personal note, to my utter shock, Gamestop has Fallout 4 PipBoys (Sorry folks, they sold out before this went live) in stock on Tuesday. I snagged one immediately, which means now I don’t have to worry about the French one coming (that ironically just arrived in San Francisco within a half hour of me making the new order). So I’ll finally get to play the game soon. Can’t say how thrilled I am. After all, I need to play so I can come up with more cool ideas for GoE II! We’re also going to be pausing our Fallout: Equestria (The Manehattan Edition) audiobook updates for a short time. We’re in the process of preparing the fourth and final version of the audiobook, with a completely re-recorded introduction and finale (with a very Audible-like style!) along with getting rid of the last series of flubs, repeated lines and glitches. Stay tuned for details! That’s it for this week folks! For those applicable, have a wonderful Thanksgiving.